The keys to getting a complex project like the Sign Invitational piece done are to start early and sneak lots of small increments of time to work on it. I use it as a reward for doing other things I don't enjoy as much. Five or ten minutes a couple of times each day adds up over a period of weeks. In the last while I found time to work on the billboard background. 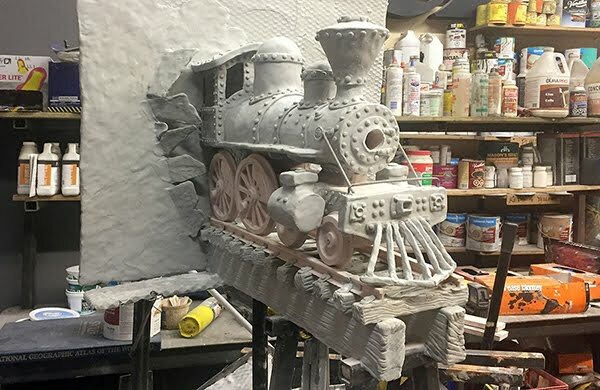 I was originally going to have the train come out of a painted tunnel but decided to have it bust through the sign board instead. I cut some random shaped bits of coroplast and coated them in sculpting epoxy. One edge of these shapes was then blended into the background surface at random angles to get the effect I desired. 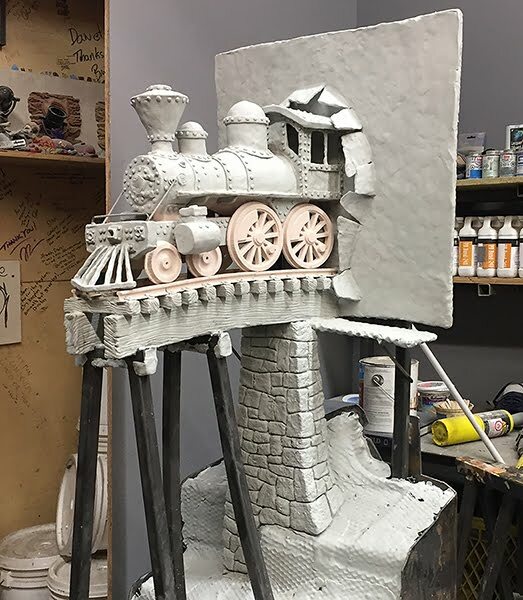 Today I found the time to do the cut stone tower for the trestle. It hides the pipe that will bring the smoke up to the train smokestack. The texture was created by pressing crumpled tinfoil into the soft sculpting epoxy. A sharpened paint stir stick was used to sculpt in the crevasses between the stones. Keeping the carving tool wet (with water) made it not stick to the epoxy.